Accountants assist their clients in preparing their taxes and with budgeting income and expenditures to protect their financial interests and future, and perhaps save them a few dollars along the way. Accountants also sometimes hire other accountants to perform the same task for themselves. But accountants, who often work on their own rather than with an accounting firm, aren’t always properly prepared for the day when they stop working and retire. Spectrem’s new report on the professionals we encounter tells the story of accountants and their retirement plans. The Professional Profile Series looks at doctors, lawyers and accountants separately, comparing them to other investors to see where advisors can best assist accountants in their investment plans and strategies. The accountants in the study have a net worth over $1 million, not including their primary residence, and should be financially prepared for retirement as a result. But 19 percent of accountants claim they are worried about being able to retire when they choose to do so. Likewise and more so, 28 percent worry about whether they or their spouse might be forced into retirement before they are prepared to do so. This is a great deal of concern for those investors who should be in a position not to worry about such things. When accountants use financial advisors, they do so from a unique position, because accountants have clients looking for financial assistance just like advisors do (even though one works on budgeting and tax matters and the other looks at investment strategies). 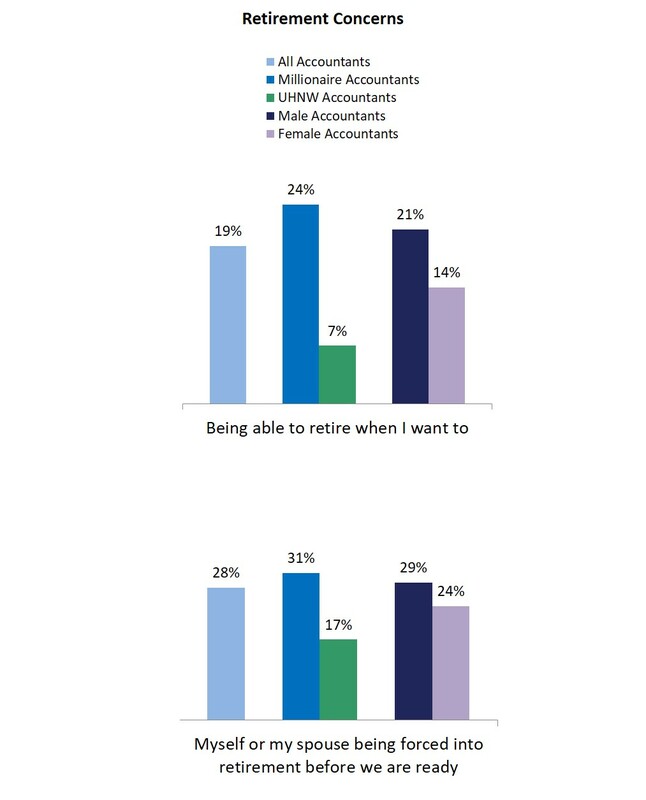 But, according to The Professional Series report, 23 percent of accountants do not feel they are getting the help and advice they need to reach their financial goals, which may be why they are concerned about their retirement plans. Perhaps it is because many accountants set up their own shop, but accountants trail all other investors, and certainly other professionals, in employer-sponsored retirement funds. Only 57 percent are in employee-sponsored retirement plans, and only 5 percent own contributory IRAs. Both are well below the average of wealthy investors. For the Spectrem studies, all investors were asked to place their concern over depleting retirement funds early on a 0-to-100 scale, with 100 indicating great concern. Accountants again turned out to be more concerned than others, placing their concern level at 27.8, notably above the average of 24.4 for all investors. What does this mean for advisors? It means there is a market to explore for new clients, and it is an area of concern when working with your current clients who happen to be accountants. Have they considered their own issues related to their future finances and retirement needs? Are they utilizing their advisor’s services to the fullest extent in order to prepare for retirement? With an eye toward future clients, finding accountants in need of financial advice could result in significant new business. It is likely all of your current clients have accountants, and it is possible to build a relationship with a new accountant client using your current client as the go-between. It’s seemingly odd that accountants would not have a concrete retirement plan of their own as they spend much of their professional time working with clients who have retirement plans or concerns. Any advisor working with a client who is an accountant needs to determine if their client has a specific retirement plan. Because accountants are less likely to have employer-sponsored retirement plans. With that in mind, advisors working with younger accountants can get a head start on retirement planning rather than waiting until it becomes a bigger concern for the client.